With the Eastern Conference Finals set to begin later this week, THW’s Ian McLaren points out that there are certainly no shortage of storylines when it comes to the Bruins and Penguins. Whether it comes from the fact that Jarome Iginla spurned Boston in a last-minute decision to head to Pittsburgh, the return of Jaromir Jagr (again) to the Steel City or the Matt Cooke/Marc Savard, um, incident, there’s plenty to talk about heading into the series. And while the drama and all those stories make for great theater, does any of it really matter? After all, when the squads square off for the right to play for the Stanley Cup, Iginla will be a Penguin, Jagr will be a Bruin and Cooke will still be hated by Boston fans. End of story; time to write a new chapter and renew a rivalry. Without question, Boston’s offensive depth will serve as a major challenge for the Penguins. Coach Claude Julien has the luxury of utilizing his entire bench in virtually any situation as a result of icing what is perhaps the game’s best fourth line. And while four Bruins have at least ten points in the ’13 playoffs, it seems that almost anyone is ready and willing to step up when the Bruins need a big goal. Clearly, the Pens will have their hands full with the “Big Bad Bruins” and their second ranked 3.17 goals per game. All that being said, Pittsburgh is simply more explosive. The only team scoring more than Boston in these playoffs? That’s right, the Pittsburgh Penguins and their gaudy 4.27 goals per game. They have six players with at least ten points and are getting contributions from everyone. Kris Letang (16) and Paul Martin (9) are first and third, respectively, in scoring among defensemen and the team has gotten game winning goals from eight different players, including Brenden Morrow, Brooks Orpik and rookie Beau Bennett. Coming off a concussion and apparent ankle injury, James Neal was struggling early in the postseason. Prior to Game 4 against the Ottawa Senators, he had managed to put up only three points in the ’13 playoffs. But he and his teammates felt it was only a matter of time before the sharpshooter broke out. And they were right. Neal notched two goals and an assist in that game, then exploded for a hat trick and added a helper in Game 5 as Pittsburgh eliminated the Senators last Friday. 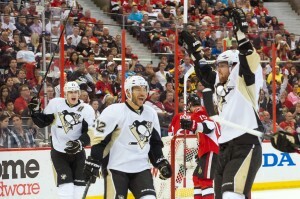 Prior to Neal’s outburst, Pittsburgh was already the most explosive squad in these playoffs. After seeing the streaky winger put up seven points in his last two games, though, “The Real Deal” hopes to make the club even more dangerous as the postseason moves on. Kris Letang’s decision-making in his own end has been questionable at best for much of the ’13 postseason. Poor outlet passes, ghastly turnovers and blown coverages have all been a part of his game at some point. And, yet, he still sits at a +7, largely due to his brilliance in the offensive zone. His ten points led all scorers in the Ottawa series as the Senators had no answer for Letang, particularly in the last two games of the matchup when he racked up a goal and six assists. Letang represents the type of dynamic defenseman the Bruins have yet to face in the playoffs. He leads all blue liners in scoring because his ability to jump up in the play wreaks havoc on opponents who can be overwhelmed by the Penguins’ quick transition game (when they’re “getting to their game”). As a result, if Letang can continue to cut down on the mistakes in his own end, he will be a nightmare for Boston to deal with and someone they may not have an answer for. Through the first two rounds of the playoffs, the Penguins have potted 32 even strength goals, compared to the 30 deposited by Boston. With such evenly matched numbers, special teams will surely play a role in the outcome of this series. And, after two rounds, it would appear Pittsburgh holds the advantage. While Boston’s power play has been good in the postseason (21.9%, ranked 5th), the Pens’ man advantage has been downright lethal. Boasting the league’s top unit through two rounds, Pittsburgh’s power play virtually dragged the club to a first round victory over the Islanders and torched the Senators in their second round series. And there in lies the problem for Pittsburgh’s opposition. When the Pens’ power play is clicking, their puck movement is second to none. What’s more, the versatility of all those talented players allows Coach Dan Bylsma to create countless looks and adjustments that are nearly impossible to prepare for. As a result, Boston’s eighth ranked penalty killing unit will have to find a way to become more effective or it could be a long series for the Bruins. The Penguins’ penalty kill has been just as vital to their postseason success as the man advantage Unlike the power play, though, the short-handed unit has been a pleasant surprise. Having finished the regular season with the 25th ranked penalty kill, the group was supposed to be a weakness for Pittsburgh heading into the playoffs. Instead, the squad straightened things out and, as a result, the Pens boast the third ranked (89.7%) unit in the postseason. They will face a Boston power play that has been a pleasant surprise of their own in these playoffs. Having finished the regular season ranked 26th, the traditionally poor Boston power play ranks fifth in the postseason coming into the Conference Finals as the emergence of Torey Krug has bolstered a unit that was once an Achilles’ heel for this team. If the Pens can maintain the stingy penalty killing that they have displayed to this point in the playoffs, it will go a long way toward getting the club back to the Stanley Cup FInals. Given that nearly 20% of the B’s offense has come with the man advantage, it will be awfully difficult for Boston to keep up on the scoreboard if their power play dries up. There are many pundits out there who believe we haven’t seen the last of Marc-Andre Fleury in this postseason. Some maintain that Pittsburgh will run into some adversity in this round or the next and, as a result, Bylsma will have a difficult decision to make. And maybe they’re right. After all, this Boston team presents an arduous task, one that the Pens haven’t encountered yet in these playoffs. The Bruins are big, they are physical, they are deep and they will give the Penguins all they can handle. That’s exactly the attitude the Penguins need between the pipes. After all, with the firepower Pittsburgh possesses, they don’t need their goaltender to be perfect; they just need him to stay calm and make the saves he should make. 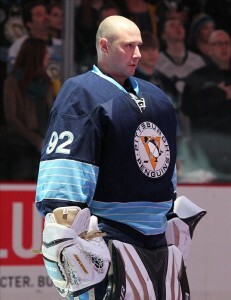 And that is precisely what Vokoun has done to this point. Have there been defensive breakdowns since the veteran relieved Fleury during the Islanders’ series? Absolutely. But, more times than not, Tomas has been there to bail his team out, providing the entire squad with a confidence that seems to grow with each game. If Vokoun can continue that steady play, the Penguins’ depth and special teams may prove enough to get Pittsburgh to a third Stanley Cup Final in six years.